Human societies have always been highly dependent upon healthy soils. This is because the earth beneath our feet underpins the environment we live in at local, national and ultimately global scales. Soils provide a platform to live upon and are fundamental to the provision of the majority of our food. They support all terrestrial habitats, store and filter water, cycle carbon and nutrients, are intimately involved in climate regulation, and even tell us about our past via the archaeology they hold. Soils are also remarkable systems. They are extremely complex both in terms of the variety of their constituents and the way these are arranged in space, from nanometres to kilometres. Soils are dynamic and reactive entities teeming with a huge variety of life, supporting levels of biodiversity that almost defy imagination. The amount of living material below ground always matches or exceeds that aboveground, and there are typically tens of thousands of microbial species and many hundreds of other tiny organisms in a handful of soil from almost anywhere. These communities can be thought of as the biological engine of the earth, working to drive and regulate the majority of the key processes and functions which soils deliver. But there's more to work than life - soils function by virtue of the way they are put together and the interactions that occur between the myriad of physical, chemical and biological components within. These all occur in the massively complex labyrinths of pore networks present in most soils. Throughout my life I've been exploring this fascinating 'inner space', the nature of the organisms that live in there, and how they make soil systems operate. 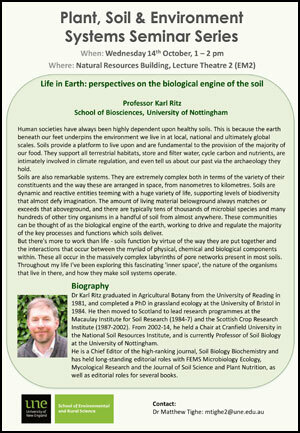 Dr Karl Ritz graduated in Agricultural Botany from the University of Reading in 1981, and completed a PhD in grassland ecology at the University of Bristol in 1984. He then moved to Scotland to lead research programmes at the Macaulay Institute for Soil Research (1984-7) and the Scottish Crop Research Institute (1987-2002). From 2002-14, he held a Chair at Cranfield University in the National Soil Resources Institute, and is currently Professor of Soil Biology at the University of Nottingham. He is a Chief Editor of the high-ranking journal, Soil Biology Biochemistry and has held long-standing editorial roles with FEMS Microbiology Ecology, Mycological Research and the Journal of Soil Science and Plant Nutrition, as well as editorial roles for several books.